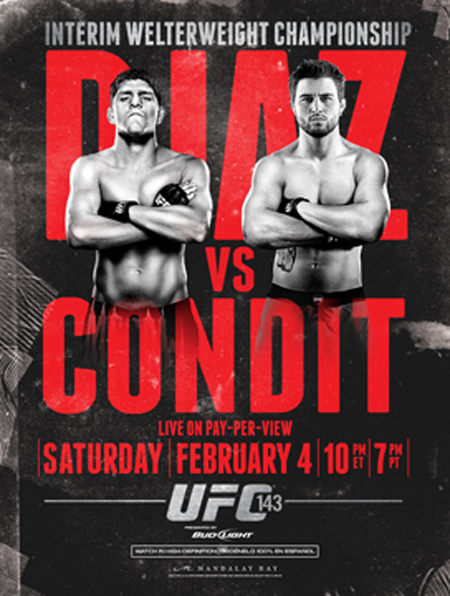 With the last-minute addition of a welterweight scrap between Dan Stittgen and Stephen Thompson, the 11-bout lineup for “UFC 143: Diaz vs. Condit” is once again complete. Stittgen holds an impressive 7-1 MMA record, while Thompson owns an unblemished 5-0 mark. Both 170-pounders will be making their big league debuts. An interim welterweight title bout between Nick Diaz and Carlos Condit headlines the pay-per-view broadcast. Heavyweights Roy Nelson and Fabricio Werdum will serve as the night’s co-main event. The Mandalay Bay Events Center in Las Vegas, Nevada hosts the February 4th festivities.